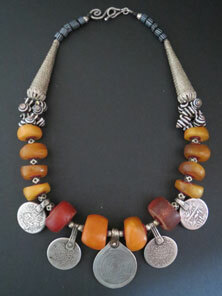 A fabulous antique fossil Amber necklace fashioned from traditional Berber elements into a modern necklace with a edge. This amber is not bakelite, 'african amber', phenolic resin or any imitation, but is real natural antique fossil amber which has become scarce and incredibly difficult to obtain. The four centre amber beads measure approximately 25mm x 15mm. Between each amber bead I have used African vulcanite heishi beads to protect and cushion the treasured beads. At the centre of the necklace is a traditional Moroccan Berber spiral pendant with 4 silver coin pendants on either side. Lots of rare Moroccan zebra shells compliment the amber beautifully and is used throughout traditional Berber jewelry. Two large Ethiopian coin silver cone beads, lots of old cornerless cube Tuareg silver beads, rare black and white striped Venetian Gooseberry beads from the 1900's African trade and a sterling silver clasp.